Flexocon Grid Spring Resilient Coupling comprises mainly two hubs, Grid Spring and Cover to protect the spring to fly off to centrifugal force and to prevent Grease to come out. Grid Spring element is so designed that it provides resiliency for variable flexibility of a Coupling and damping properties making the Coupling very for drives involving high shock loads to the extent of 80%. 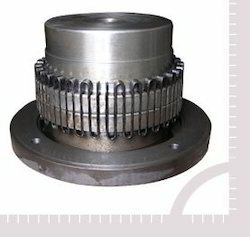 Misalignment - Angular, Parallel or Axial, that inevitably occurs between rotating shafts, which are independently supported, is also taken care of by the Spring element within allowable limits. All Metal Construction having no fast wearing out components. Torsionally flexible Transmit full torque with dampened vibration and deduced peak load. Accommodates angular, parallel and axial misalignment. Standard Couplings with vertically split cover. Standard Couplings with axially split cover. Flanged Couplings with vertically split cover. Flanged Couplings with axially split cover. Flexocon Engineers Private Limited established in 2001 as a Manufacturer, Exporter & Supplier of Metallic Expansion Joints, Rubber Expansion Joint, Geared Coupling, Grid Spring Resilient Coupling etc., backed by few qualified Mechanical Engineers having more than 15 years Experience in Mechanical Power Transmission Coupling & Expansion Joints field at various application. Flexocon Engineers Private Limited is a dynamic service oriented manufacturing company. The technical calculations of Flexocon Engineers Private Limited designs are based on recognized standards and carried out on our specially developed computer program and displayed on our CAD system. Experienced and well-trained staff in the Engineering Department and in Production, combined with continuous R&D efforts - that is how we believe optimum solutions can be found for the manufacturing of the Couplings & the Expansion Joint. Flexocon Engineers offer Coupling & Expansion Joint of proven design & they are ready to give performance much longer than their Guarantee Period to the total satisfaction to the customer.